My name is Amy and I live in Southern Maryland with my husband, Tom, and two kids. We live on a 250 acre farm with several other family members. I was given the opportunity to build a house on the family farm that I grew up on and that’s what I did. My husband and I both have 40 hour a week jobs but we have a vision and a dream to be able to transition to living off the farm. There are many reasons for wanting to take up farm living full time. I didn’t always fully appreciate how lucky we are to be living on a farm. As a kid, living on this same farm, there was a lot of hard work that had to be done and everyone had to pitch in. When I left for college, I never expected that I would move back here but suburban life was not for us. For the first decade that we lived here, my father did all the “real” farming. He grew corn, soybean and wheat. As I watched my dad get older and start to slow down, I started thinking about what would happen to our farm when he could no longer take care of it. Preserving the heritage of our family’s farm was very important to me but I wasn’t interested in growing corn or soybeans. So I did some research and found out that the wine industry in Maryland was still growing and trying to get established. And they needed more farmers to start producing Maryland wine grapes. My husband and I jumped in and planted an acre of Chardonel vines in 2012. It was quite a steep learning curve but so far we have been successful at growing and selling wine grapes. We ended up planting another acre of Chambourcin vines in 2016. I’m sure that we will continue to expand the vineyard as we transition to relying on the farm for our income. One final reason that we are working toward living off of the farm – our daughter, Megan, is passionate about animals and we want to encourage her passions. She has always been interested in animals. When she was 5, she could recite facts about most any shark in existence. Then she moved on to learning everything she could about lions. 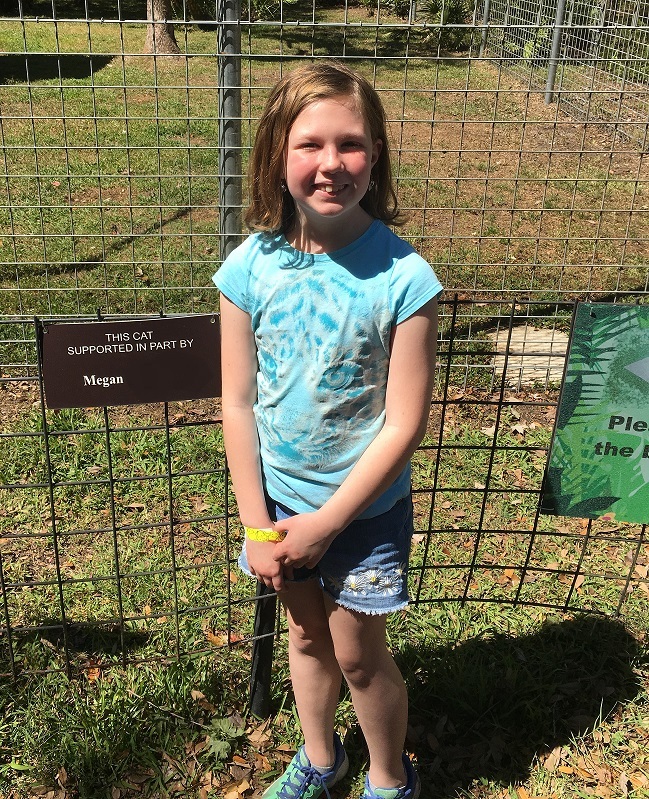 For her eighth birthday party, she asked her friends to bring a donation for the Big Cat Rescue organization in Tampa, FL instead of a gift. She raised over $500 and got her name on a plaque at the rescue center. My husband and I have filled the house with animals but there are many more opportunities to introduce animals on our farm as a way to teach our children about life and work and responsibility. So, bringing more animals onto the farm serves two purposes: 1) an educational opportunity for Megan related to something that she is already passionate about and 2) a way to start providing some of our own food as a step down the road toward healthy living AND financial independence. Our goal is to add chickens, goats and eventually pigs to our farm. We have a lot to learn and we look forward to doing it together as a family. We are being Raised By The Farm and I want to share everything that we learn along the way with you! Thank you for joining us on our journey. Hi, my name is Megan. I am 10 years old and my mom is Amy . Whenever you see Megan’s Thoughts , just know that this is my part of the blog. I am going to start off with the basics. I love animals !!!!!!!!! All of them. Like spiders, snakes, lions and sharks. Those last two are my favorites. Because of my passions we have a lot of animals. we have 1 dog, 22 cats!!!!!!!!! I know. We have a lot of cats!! Anyways , we also have 1 bunny , 1 hermit crab, 11 fish and 2 frogs. We are also planning to get some alpacas and a bearded dragon for me !!!! I will make sure to post some pictures of my animals later in the blog. Now I know this is going to sound sad but, I can’t remember all my cats names . AHHHHHHH!!!!!!!! But the ones I can remember are Samantha but she is currently missing sooooo ya. Also I have my cat Tucker, Jr., Dale, Charity, Tony, Sam, Oreo, Tyler, Mama Cat, Max, Rocky, Supper Kitty, Patches and my kitten Wolfy. I am so blessed to have all these animals. Another important part of my life is my slime. The last time I counted, I had 164 different slimes. But I have made more since then so technically I have more than 164 slimes. I’ve been making slime for about a year and a half now. I have butter slime, fluffy slime, jiggly slime, and the list goes on and on and on. I’m not really sure why I like it so much but one thing is for sure – I’m obsessed! Whenever I make slime, I feel happy. Cause I feel like I’ve made something special. Whenever I play with it, it’s like playing with a stress ball (and I have lots to choose from). If you want to know more about my slime, there will be an upcoming blog post about it. When I grow up, I want to open an animal shelter or be a vet tech. I don’t want to be a vet because I can’t do surgeries. Whenever I see a documentary of surgery on TV, I always cringe in my seat. I also hope to inherit my parents’ winery one day. One of my biggest fears is pain. I hate the thought of being hurt. When I had to get my blood drawn for the first time, I almost fainted. Just like my dad, I hate needles. I also hate roller coasters! Some of you may think that I’m crazy because of this (like my mom and dad) but if not liking roller coasters makes me bad then sorry, I’m bad.